One person was killed and three were injured in this Aug. 18 crash in Tulsa involving drunken driving, police said. A 27-year-old man who was intoxicated and speeding in a Ford Mustang leapt a center median into oncoming traffic on Memorial Drive and struck a Nissan Versa. 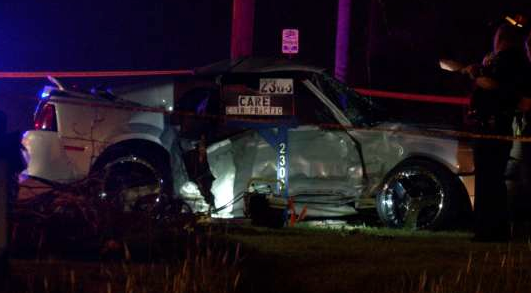 A passenger in the Ford Mustang was killed. During most of the past two decades, the annual number of alcohol-related traffic deaths across the country has fallen by about 20 percent, to more than 11,500. More stringent drunken driving laws, widespread public education campaigns and safer vehicles have all played a role in that sharp reduction. In Oklahoma, however, it’s been a much different story. Despite having the same safer vehicles, increased educational efforts and tougher laws, the state saw a 10 percent increase in alcohol-related traffic deaths between 1994 and 2012. The trend mystifies state public-safety officials. In 2011, there were 249 such fatalities; last year, there were 261. Only six other states also saw increases over the 18-year period, according to the most recent data from the National Highway Traffic Safety Administration. 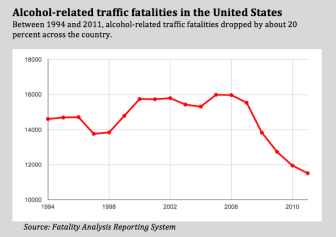 in cutting alcohol-related traffic deaths. The picture is similar for overall traffic fatalities. 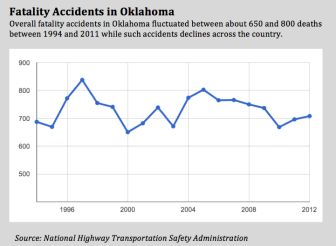 Since 1994, road deaths in Oklahoma have hovered around 700 or 800 per year, or about two per day. The country as a whole has seen a 21 percent decline. Oklahoma’s fatality rate per 100 million vehicle-miles driven has dropped, particularly in recent years, but not as much as the nation’s. The state had the ninth highest rate of traffic deaths in 2011. If just Oklahoma’s alcohol-related traffic-fatality rate had declined at the same pace as the nation’s since 1994, 47 fewer people would have died last year. 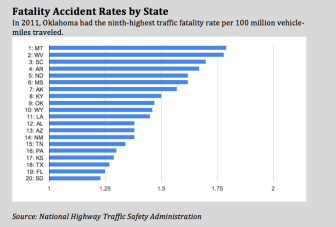 Why Oklahoma is doing relatively poorly in reducing traffic deaths isn’t clear. The state already has implemented many of the best practices used in other states, Thomas said. For example, Thomas’ office coordinates seat-belt awareness campaigns and increased enforcement efforts, as well as impaired-driving training and enforcement campaigns, which ramped up in 2012. The state also employs a full-time prosecutor to help smaller communities in Oklahoma enforce drunken driving laws. The Office of Highway Safety is conducting a study looking specifically at drunken driving fatalities, and that report should be ready by the beginning of 2014, Thomas said. The study should give his agency more insight into why the numbers are relatively high, he said. Oklahoma Watch examined various data sets that track causes of traffic fatalities but did not find any large differences between Oklahoma and U.S. figures. For instance, the percentages of U.S. and Oklahoma drivers in fatality accidents without licenses, with suspended licenses or with previous DUIs were all similar. So were the percentages of fatal accidents whose main causes were speeding and distracted driving. The only area where Oklahoma had a disparity was in seat-belt usage. Between 1994 and 2011, 58 percent of fatality victims in Oklahoma were not wearing a seat belt, compared with 51 percent nationwide. 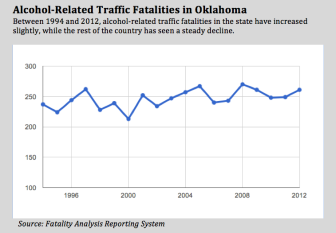 Ralph Hingson, director of epidemiology and prevention resources at the National Institute on Alcohol Abuse and Alcoholism, said Oklahoma’s laws appear to be in line with those of other states that have seen alcohol-related traffic deaths decline. In some cases, though, Oklahoma has been slower to adopt tougher policies. It wasn’t until 2011 that the state implemented a stricter law for use of ignition interlocks alcohol-detection devices that drivers must breathe into before starting a vehicle. The law, enacted after University of Oklahoma student Erin Swezey was struck and killed by a drunk driver in 2009, requires those convicted of drunken driving for the first time to use an interlock for at least six months. Offenders with multiple convictions must use an ignition interlock longer. Oklahoma has yet to see a reduction in alcohol-related deaths since the ignition-interlock law was passed. But several states, such as Missouri, Minnesota and Kansas, have seen reductions after the laws took effect. But an ignition-interlock law and other laws on the books mean little without stricter enforcement on the streets, said Lt. Garrett Vowell, the Oklahoma Highway Patrol’s impaired-driving enforcement coordinator. Cutbacks to police budgets have hampered enforcement efforts in recent years, he said. The Oklahoma Department of Public Safety, for instance, has seen its budget decline from $225 million in fiscal 2009 to $206 million in 2013. The Oklahoma Highway Patrol, which is part of DPS, has been short-staffed for several years; last year it graduated its first class of cadets since 2009. Vowell said police have to be smarter now, such as by using data to isolate hot spots of drunken driving activity and training officers better to detect impaired drivers. Regardless, making a big dent in the numbers “isn’t easy to do,” he said. “We’d like to look at the end of the year and see zero (fatalities)… We’ve got a long way to go,” he said. Moving urgently to address the issue in Oklahoma is key, especially when the numbers haven’t mirrored national trends, said Kathy Stewart, director of dissemination at the California-based Prevention Research Center. “Complacency is the enemy,” Stewart said. She encouraged more DUI checkpoint enforcement efforts, stronger emphasis on curtailing underage drinking and increased overall police enforcement. “The fact that this hasn’t drawn more attention … seems unfortunate,” she said. Felicia Jones is one of many Tulsa-area residents who depend on local bus service but struggle to make the system work efficiently for them.